So, What’s The Best Bait for Salmon? If you’re wondering what bait to use for salmon fishing, you’re not alone. These clever fish are wily and in most places, highly sought after. You’ll need both a solid bait, and a solid presentation to land these suckers. They swim and feed deep in the water, and they have a tough and resistant jawline, so you’ll want to make sure that your hooks are sharp and tackle is up to snuff. 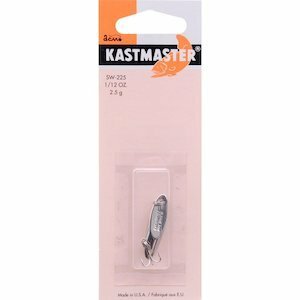 Setting all this aside however, let’s get into our picks for the best bait for salmon fishing in the river. The Green Label eggs are a tried and true salmon bait. For some reason, salmon just love to eat their own kind! 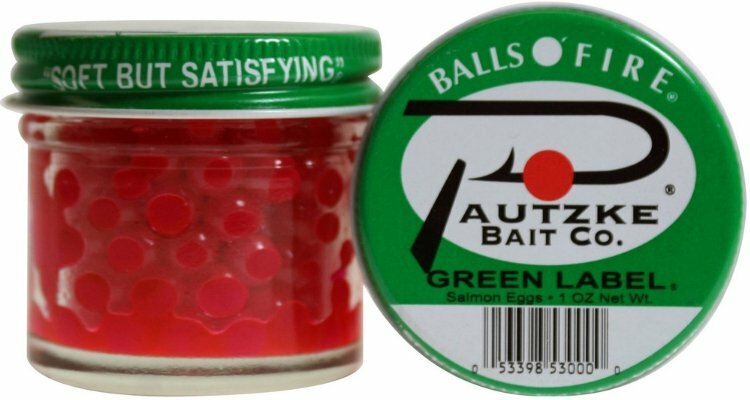 Straight up, the best bait for salmon fishing in the river (or virtually any situation) is salmon roe, and if you want to pick up some roe for your next Salmon trip, the Balls O’ Fire green label are a great way to go (they also work awesome for trout and other stream strikers). If you are a new angler, it may strike you as strange that salmon roe bait actually works. After all, why would salmon like to eat their own eggs? There are lots of theories out there about exactly why this is. Some folks say that Salmon have no idea that they’re actually eating their own species, because they’ve never really seen them before. Others say they know, but it’s purely survival instinct. Salmon roe is an excellent source of fat and protein, it has a distinctive scent, and so the fish aren’t discerning and go after it. Other people say that Salmon are eating the eggs of others to eliminate competition for their own eggs. And finally, you’ll find people on forums and blogs saying that Salmon don’t actually eat the roe, but rather they hold them in their mouths in order to transport them. To be perfectly honest, we don’t have a dog in the fight, and we don’t care why it works…. just that it DOES work! If for some reason you’re not getting any hits on salmon roe (or if you’ll be trolling a lot of open water), try running cut bait. 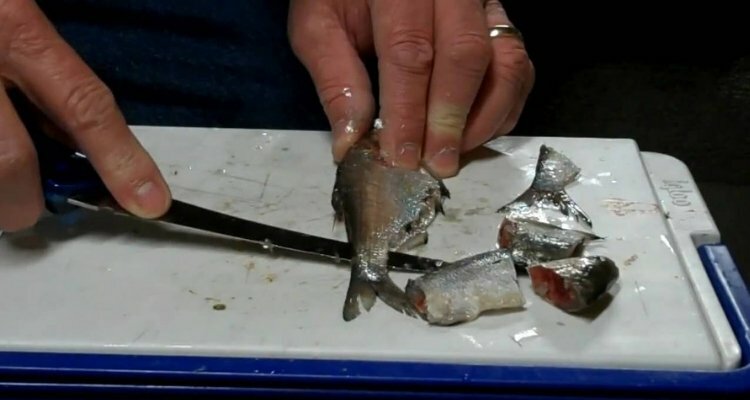 If you want an alternative live bait to use when fishing for Salmon, lots of guys use a cut bait of Herring or similar fish. This simply means using a bait sized piece of fish with your hook of choice. A piece of cut bait is also a popular way to fish when trolling, particularly at the very bottom of rivers, just before they open to the ocean. Obviously this scenario is where Herring makes the most natural sense. 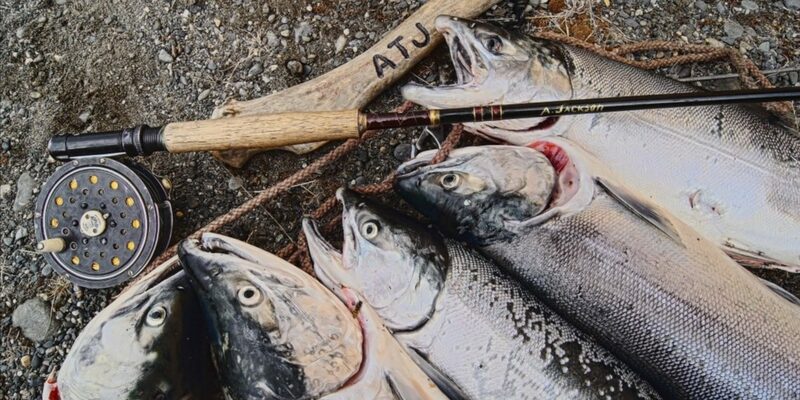 Fishing a spoon in lower water can be extremely effective on salmon. Bring a couple along and give it a shot. If you prefer to use a Salmon lure over live bait, there are several options available. Spinners and spoons in particular can be very successful, because the Salmon respond so well to anything shiny. The main thing to keep in mind is that Salmon are bottom feeders, so whatever weight setup you prefer, you’ll need to keep your lure bouncing slightly along the bottom. 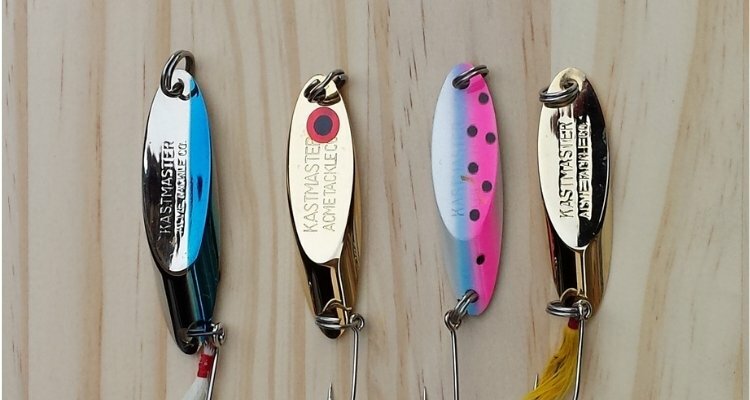 If you had to pick just one lure to go with, our favorite is the Kastmaster. This is actually more of a jigging spoon than a “cast and retrieve” spoon, but it has a great fluttering action as it drops (although it does have a decent wobble if you are cast and retrieving it with little pauses). It’s awesome for the King Salmon when they’re down and hugging the bottom. We like the straight nickel, the blue nickel, or even the gold pattern.